In June 2011, OSHA implemented their new residential fall protection rules. This short video explains a common sense approach to comply with these new rules. A copy of the new rules can be obtained by visiting www.OSHA.gov. This video addresses how these new rules affect the obligations of the general contractor. These rules apply to any tradesmen that work more than six feet off the ground or a lower level. The new rules require fall protection for any employee working on the roof. The historical problem with this approach is that residential structures do not have an obvious attachment point for a harness. Commercial structures usually have flat roofs so a guardrail system can be used in that scenario. The pitched roofs on residential structures, with their gable ends, make the guardrail solution impractical. 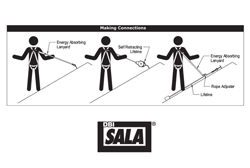 By using the DBI Sala U-Bolt Roof Anchor, a personal fall arrest system can be easily attached to a pitched roof. The homebuilder supplies this device. The framing contractor attaches the anchor to a roof truss while the truss is on the ground. 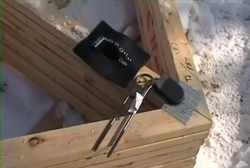 The roof anchor is easily incorporated into a contractor's use while on the roof. An additional benefit to the homeowner is that the anchor is a permanent installation. It's there for the homeowner to use for future maintenance needs. Wisconsin businesses, for more information on OSHA compliance issues contact knowledgebroker Paul Seitz 262-953-7245.